Intel again promises cool devices with Curie, but will they come? Intel wants wearable device technology to be inconspicuous, so it’s making its Curie wearable computer available through a button-sized board or as part of a chip package. The Curie, slated to ship in the second half of the year, was first shown at CES in the form of a button-sized computer on Intel CEO Brian Krzanich’s suit. The almost invisible Curie had technology that could read heart rates, and transfer the data wirelessly using Bluetooth. 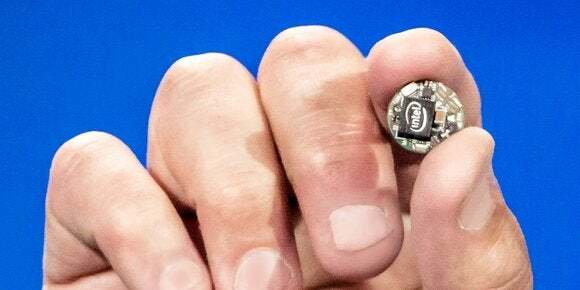 Blending technology discreetly into wearables is Intel’s goal with Curie, which will go into a wide range of tiny coin battery devices that can run for days and months without a recharge. The wearable computer is for non-technical customers, such as companies outside of the IT industry, that want to plug and play technology into devices, clothes and accessories. Intel’s larger wearable computers like the SD card-sized Edison were mainly adopted by enthusiasts. The company is considering a different approach to make Curie and its components accessible to a wider audience. One would be to sell a prebuilt “board” resembling a button with the Curie chip, wireless circuitry, sensors and expansion ports on it, said Mike Bell, corporate vice president and general manager at Intel’s New Devices Group, in a recent interview. “Literally, you hook up a battery, you hook up some wires, and you have something you can build a product out of,” Bell said. The other option would be to provide a smaller multi-chip package with just the Curie processor, radio and other basic circuitry. It’ll be smaller and come without the board, and will be ready to implement in wearable devices. That package will be quicker to implement, and should give device makers more flexibility in size when designing wearables. Intel sells the Basis Peak smartwatch, but is taking a partnership approach as it tries to sell more chips in the fast-growing wearable market. Intel’s technology is already in SMS Audio’s BioSport earphones and Opening Ceremony’s MICA smart bracelet. Intel has also partnered with eyewear companies Luxottica and Oakley and watch company Fossil Group. However, until now, Intel’s software technology has been used in wearables more than its chips. Whether an Intel chip is used or not, the company wants to make building wearables approachable and easy, Bell said. “It’s really cool to be able to put together products that allow people to do great things without becoming engineers. That’s a lot of fun,” Bell said. Curie has a low-power Quark chip, Bluetooth wireless capabilities and a sensor hub to track activities like steps. It also has a pattern recognition engine, and software packages—called IQs by Intel—are key to analyzing collected data. For example, the health software package will use the pattern recognition engine to quickly analyze steps and other health data. “All these devices are interesting only if you can do something with the data,” Bell said. Fashion companies don’t have time to think about technology, and the software packages make implementing Curie into wearables easy, Bell said. Still, Intel faces significant challenges as it tries to make a mark in wearables. Like it did in mobile devices, Intel has to contend with ARM and MIPS, whose processors are used in most wearables today. Intel’s emphasis in wearables is on “making it easy and making it early,” said Dean McCarron, principal analyst at Mercury Research. The early approach is to prevent what happened to Intel in tablets from happening as well in wearables. ARM got a head start in tablets and now dominates the market. The wearables market is growing, and Intel wants to ensure the next big hit product has its chips, McCarron said.